It was a pretty straightforward bit of research. I was writing about my father’s experiences during World War II and simply wanted to know what the weather was like on the day he arrived at Carlstrom Field in Arcadia, Florida to begin his primary flight training. My memory of the years I spent at the University of Florida led me to believe I already knew the answer. It was August in Florida so, there was a pretty high probability what my father encountered in 1942 was temperatures in the low to mid-nineties with a chance of afternoon thunderstorms. That’s what August in Florida was like in the 1970s when I was in college. That’s what August in Florida was like in 2017, the last time I visited my brother and his wife just south of Ocala. That’s what August in Florida has been like for at least the last ten thousand years. However, as sure as I was about the weather, I didn’t want to just guess. Using the online resources I have come to depend upon for this sort of stuff, it should have only taken a couple a minutes to find what I needed. It would be a month before I got back to my father’s story. I logged into Newspapers.com and searched for the word, “weather”, in all available Florida papers for August 7, 1942. I got hits for periodicals all over the Sunshine State. The closest one to Carlstrom Field was The Tampa Times. From experience, I knew most dailies in those days had a local weather summary on page one in the upper left hand corner. The Times was no exception. As predicted, the forecast for that day in question was temperatures low 90s with a chance of afternoon thunderstorms. Bingo. I had what I came for. I should have just closed the browser and moved on. However, my eyes were drawn to the enormous banner headline just below the weather that announced Russian tanks had stopped the German advance on Stalingrad. Looking back, we now know that headline heralded the beginning of what was going to be a very bad winter on the eastern front for forces of the Third Reich and, more importantly, the end of Herr Hitler’s territorial expansion. From 1942 onward, Germany would, for the most part, be on the defensive and in retreat. Already knowing how World War II ends, I skipped the Stalingrad story and quickly scanned the rest of the page. There were headlines on Ghandi, the Tampa sanitation department, a fatal car accident, the trial of an American traitor, and a meeting of United Nations’ envoys in Moscow but nothing really grabbed my attention. I’m a sucker for the lurid, dime store detective, supermarket tabloid style of writing that was, in those days, the stock-in-trade of almost every newspaper in the country. The story wasn’t at all what I was looking for but, now that I had seen it, I was hooked. I had to know more about the blonde and the ball player. 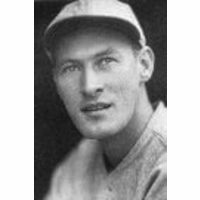 Gordon McNaughton, the deceased, had, indeed, pitched for the Boston Red Sox. 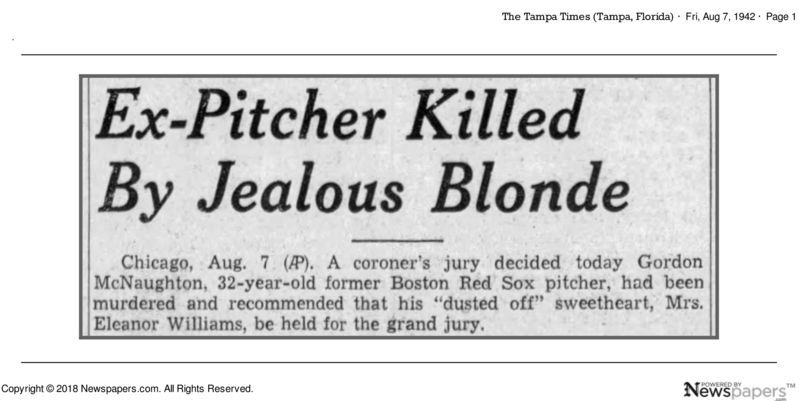 In August of 1932, exactly ten years before making headlines in The Tampa Times for getting himself killed, Gordon McNaughton pitched six games for the Boys from Beantown. The 22-year-old’s major league career lasted all of 35 days. It turns out, 35 days was just long enough for him to achieve a kind of immortality by making a small contribution to Boston’s all-time worst won/loss record. In 1932 the Boston Red Sox went 43/111, a record that still stands today. Ten years later, in August of 1942, Gordon, a native Chicagoan, was once again living in his home town, working for the post office during the day, and running dice games in local taverns at night. Divorced, McNaughton and his eight-year-old daughter, Patricia, were living with his parents at 3505 Sheffield Avenue, a block south of Wrigley Field. The previous month, Mrs. Dorothy Moos, a 27-year-old, brown-eyed blonde from Minnesota with a 10th grade education left her 34-year-old husband, Fred, a grain speculator who also “owned a race horse or two“. Dorothy had already divorced Fred once before but it didn’t work out and they had remarried. Until this most recent separation, Dorothy and Mr. Moos had been living at 3812 Kenmore Avenue, a block west of Sheridan Road and, coincidentally, three blocks north of the McNaughton residence. In the newspapers, Dorothy, a sales girl in a candy shop, revealed the circumstances that led to her to abandon her husband for a second time. I am sure Fred had a perfectly good explanation for the gathering and why that girl was wearing his pajamas but Dorothy didn’t stick around to hear it. She fled a mile straight north up Sheridan Road and took up residence at the New Lawrence Hotel. A day or two after moving into the New Lawrence, Dorothy met Gordon McNaughton at the Arlington Race Track. She and Gordon hit it off immediately. It appears, Mrs. Moos was not the kind of woman who spent a lot of time agonizing over a relationship gone bad. She told reporters that during their three weeks together the 6’1”, ex-big league pitcher was “kind” and he took her out several times with his little girl. Dorothy grew up in a broken home and, given her recent troubles with Fred, it was no wonder she gushed in newspapers all over the country, “It was like I always dreamed it could be”! Dorothy felt she had met Mr. Right and that after suffering through a couple of days of living on her own, her life was finally on the mend. The biggest and most immediate obstacle to a happily-ever-after ending to this fairy-tale romance was Gordon’s other girlfriend, Mrs. Eleanor “Honey” Williams. It seems Gordon had a weakness for other men’s wives… And they for him. Three years earlier, Eleanor, an ex-dancer and sometimes waitress from Ontario, Canada, who the newspapers described as a 25 year-old “dice girl”, had left her husband, Clarence, and their daughter for a relationship with McNaughton. The term, “Dice Girl“, was unknown to me and the closest the newspapers of the day came to providing an explanation was the answer a lieutenant at the Summerdale Police Station gave to a reporter who asked about it. The reporter accepted this perfunctory description and dutifully recorded the lieutenant’s response. I, on the other hand, needed a more complete understanding of what Gordon and Eleanor were doing with their evenings in bars around The Windy City. A little research turned up a dice game called, “Twenty-six”, that was popular in taverns in the mid-west from the 1920s to the 1950s. Dice Girls were attractive young women skilled in the art of talking men into wagering their hard earned money on a game specifically designed to relieve them of that money. During the game, the dice girl encouraged the player, kept track of the action, and once the inevitable happened, assured the poor sap he was sure to win the next time. According to all reports, Eleanor was a very skilled dice girl. In the game Twenty-six, a player would pick a number between 1 and 6 and then throw 10 dice 13 times. The player would win if their chosen number came up 26 or more times, exactly 13 times, or less than 10 times. As with all good house games, winning sounds invitingly easy. In fact, the tavern had an 18% edge. For comparison, Las Vegas was built and thrives on a house edge of .5% for Blackjack, .8% for Craps, and 5.5% for Roulette. The only casino game with a better house edge than the dice game Gordon and Eleanor were running is Keno. The house edge for Keno is 25%. Seriously, stay away from Keno. When Dorothy met Gordon at the racetrack, he and Eleanor had been seeing one another for three years. Honey considered the relationship current and somewhat exclusive. “She (Dorothy Moos) thinks she had a great romance! Three weeks is all she knew him and I’ve been like a wife to him for three years. Why, he even used to beat me when I went out with other fellows!”. Let’s just pause for a moment and let that Valentine card sink in. On Wednesday evening, August 5th, 1942, while working at the Fireside Inn, a tavern in Lincolnwood, Eleanor hooked up with one of those “other fellows”, a 34-year-old police officer, Bernard “Barney” Towey. Later that evening, Eleanor and Barney left the Fireside to get a room at the Aragon Arms at 4917 North Kenmore Avenue. Unfortunately for everyone concerned, the Aragon was a city block south of the New Lawrence Hotel. According to the newspapers, on the way to the hotel with Barney, Eleanor spotted Gordon’s car parked in front of the New Lawrence. For Eleanor, a line had been crossed. In Chicago, the early morning of Thursday, August 6, 1942 was an unseasonably cool, 61 degrees. Around 7am, as Barney slept, Eleanor stole the officer’s gun, slipped out of their room, and made the 5-minute walk to the New Lawrence Hotel. Being intimately familiar with Gordon’s morning routine, Eleanor showed the desk clerk a phone number and asked if anyone in the hotel had called it. She knew from personal experience that it was Gordon’s habit to call in sick to the Post Office whenever he was having an especially good time. Finding out the Post Office had indeed been called; Eleanor rang the room and announced she was coming up. The elevator operator let the angry woman off on the twelfth floor. Eleanor stormed down the hall to room 1244, pounded on the door, and, brandishing Barney’s revolver, brushed past Dorothy when she opened it. I like to think heaven has some sort of contest for most regretted last words. 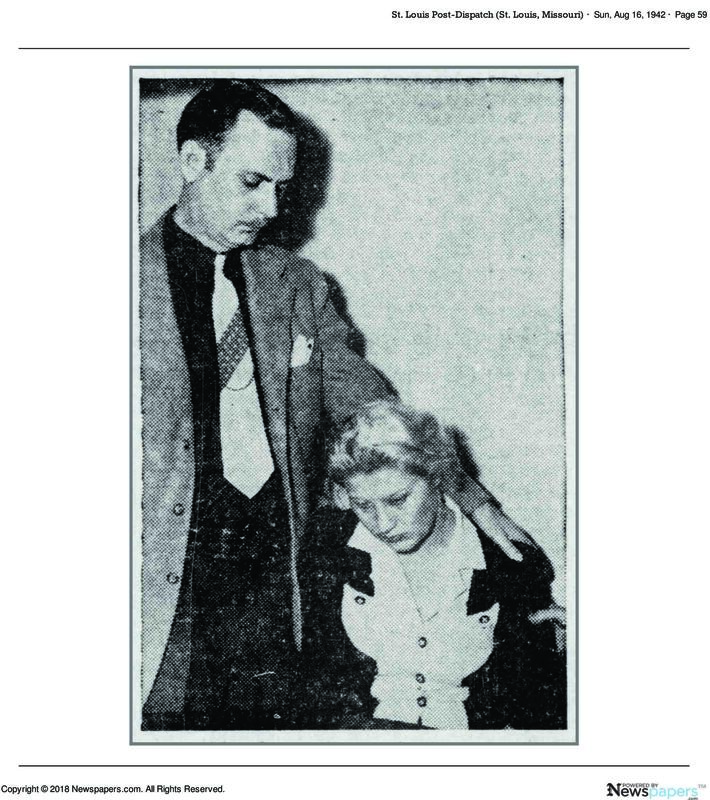 A couple of months after the murder, the Chicago Police Department fired Barney Towey for allowing Eleanor to steal his gun. The discharged police officer, who was the only unmarried actor in this adulterous drama, shot himself to death the following day. Eleanor’s ex-husband, Clarence, went to the jail where his wife was being held for murdering her lover and asked her to remarry him. Clarence Williams comforts his wife during the corner’s inquest. Eleanor was found guilty of manslaughter, received a sentence of 1 to 14 years, and was sent 90 miles southwest of Chicago to the women’s reformatory at Dwight, Illinois. 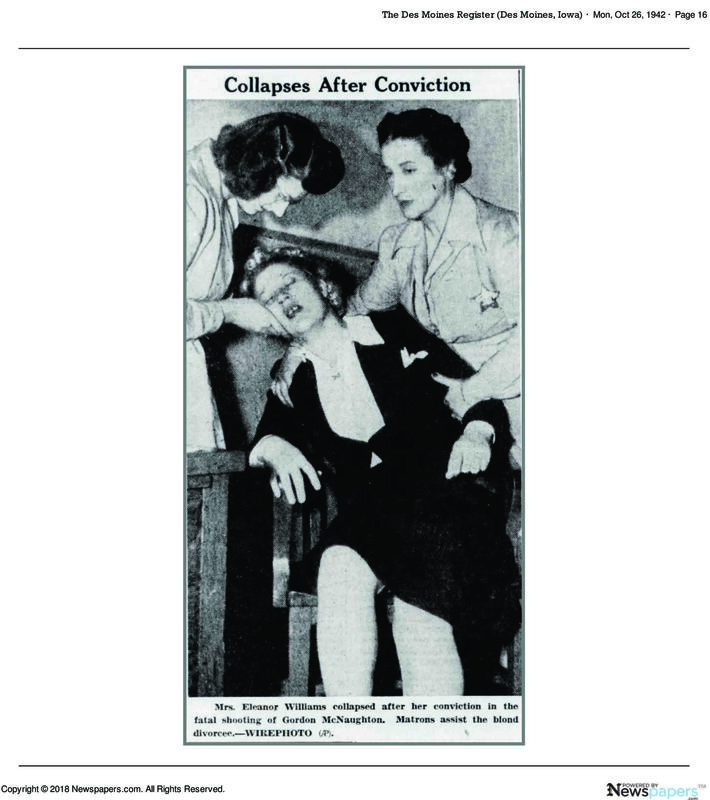 After that, except for a single story in November of 1943 about the state’s attorney filing papers opposing Eleanor’s application for parole, the killer blonde disappears from the news. A search for her husband, Clarence Williams, is complicated by thousands of hits for the Mod Squad actor, Clarence Williams III but, as far as I can tell, neither Clarence nor Eleanor make the papers ever again. As for Dorothy and Fred Moos, it looks like Fred forgave Dorothy for her dalliance with the ballplayer and she forgave him for the party with the strange girl in his pajamas. In 1946, three years after the murder, there is a record of a Fred and Dorothy Moos of Chicago, Illinois, sailing from Haiti to New Orleans aboard the S.S. Atlantida, a banana freighter operated by the Standard Fruit Company. Now the Dole Food Company, in those days Standard Fruit was famous for bananas and interfering with Central American governments. The Standard Fruit Company, along with the United Fruit Company, helped introduced the term, “banana republic”, into our lexicon. In addition to banana bunches, the Atlatida also carried 70 or so “first class passengers”. On the ship’s passenger manifest, Fred listed their address as 7100 North Sheridan Road, Chicago. Located at the corner of Sheridan and West Estes Avenue, directly across the street from Loyola Park, it was less than four miles north of the scene of the crime. In 1975, a retiring Chicago police officer recalled working on the McNaughton murder and described Dorothy Moos as a “prominent socialite”. If she indeed achieved some kind of social status, it was well after the murder and the banana boat vacation to Haiti and went completely unnoticed by Chicago newspapers. It is worth noting, the same retiring police officer also mis-identified the victim in that long ago murder as having once pitched for the Pittsburgh Pirates. So… there’s that. Remarkably, both the New Lawrence Hotel and the Aragon Arms are still in business. The New Lawrence fell into disrepair, was overhauled in 2014, and, today, is an upscale apartment complex called the Lawrence House. The Aragon also fell into disrepair but, sadly, remained exactly where it fell. I gave Frank’s Yelp review of the Aragon Arms five stars. They don’t write newspaper stories like that anymore. I’ve known Sam McMurray for twenty years. I’ve been a fan a lot longer than that. From Kojak and The Jeffersons in the 70’s to Moonlighting and Raising Arizona in the 80’s… From The Simpsons, The Tracy Ullman Show, Pinky and the Brain, and Johnny Bravo in the 90’s to Friends and Breaking Bad in the 2000’s to Grey’s Anatomy and Devious Maids in this decade… Sam has done a lot of great acting. Check him out on IMDB. These days, he and I are part of a ragtag group of actors, writers, producers, directors, and miscellaneous other members of Hollywood’s unsteadily employed who regularly get together to play golf and complain about the things men our age complain about. Which is pretty much everything. The above photograph was taken in early August of 1933. The woman on the left is my father’s mother, Virginia. She is posing with her friend Marian Cunningham. They are in Colorado. That year, America was fully and firmly in the grip of the Great Depression. Jobs and, by extension, money were very hard to come by. Virginia’s husband was working in New Jersey and their only child, my father, was living with Virginia’s parents in Atlanta, and Virginia was in Colorado simply because that’s where her job was. This situation was not uncommon in America in 1933. While researching the company my grandmother worked for in Colorado, I stumbled across newspaper accounts of a sensational crime in New York City that Virginia and her husband and her parents would have undoubtably been following that August. It was in all the papers. One of the items I found among my father’s papers was the 1949 receipt for my parents’ first television set.